Once again, thank you very much for your efforts. BabelMap in particular has been a great tool for my needs. BabelMap is - allow me to say this - indispensable and unsurpassed! Many thanks. For some reason BabelMap is unable to launch help ("Failed to launch help."). Is there another file that needs to reside side-by-side with babelmap.exe? There used to be a help file, but I am afraid that it is out of date and no longer available; and I do not currently have the time to create a new one. Hopefully you will find that BabelMap is intuitive to use, but if you do have any questions please do not hesitate to ask. A very useful tool, great! Okay, total noob question here: How do I get the 'empty' character sets (the ones that are blank but which have values assigned to them; e.g. Egyptian hieroglyphs) to display? Do I need to install fonts for that, or maybe a keyboard? Your advice would be much appreciated. Unicode only assigns characters, but does not provide the fonts. Therefore, in order to be able to see newly assigned scripts and characters you need to install the appropriate fonts. The best place for finding specialist Unicode fonts is Alan Wood's Unicode resources site, but for recently assigned characters or scripts there may not yet be any fonts available. @Andrew: Thanks! Yup, that's what I thought. That link looks very promising, I'll go and have a look. The Numeric Value of U+5146 is given as "-727379968". I take it that's not intended? Thanks for finding that -- it is of course incorrect, and should be "1,000,000,000,000". I am not working on BabelMap/BabelPad at present, but will fix it in the next release later this year. I was wondering if there is any way to pass clipboard text to Babel map's font coverage utility as a command line, so that one could select text in a document and check what fonts would have the coverage. Or if you could just add an option to read the clipboard content to the util when Babelmap is started, as a default action. Final request. Could Babel Map indicate font coverage for default installs of XP,Vista,W7. You could paste the text into the edit buffer, and check the "all characters in the edit buffer" radio button in the Font Coverage utility. Alternatively, you could open the document in BabelPad, and run BabelPad's font coverage utility ("Font Coverage..." from the "Tools" menu). Could do, but not sure it would be very useful as the user can quite easily manually paste the contents of the clipboard into BabelMap's edit buffer. Could Babel Map indicate font coverage for default installs of XP,Vista,W7. I don't think so. Listing coverage for fonts that are not installed on the user's system (or which conflicts with the actual coverage on the user's system) would be very confusing for most users. Request: Please modify F2's current behavior to set focus to the Go To Code Point edit prompt, rather than just jumping back to the earlier code point, as I'm very often needing to jump around to new code points by value. Thanks for the praise. I'll consider your F2 request ... it just depends upon whether there are other users who like the current behaviour or not. An indispensable tool for someone like me who needs to access the new medieval Latin fonts that are included in the Unicode 6.0 spec. May I make one suggestion for improvement? Remembering the Unicode values or name for any particular character can be tiresome. It would be great if there was a Favourites toolbar under the main menu, where you can drag the special characters you use the most, and a button is created there. That way, and if the Edit Buffer at the bottom was expanded a little, you would have a complete Font Viewer/Character Map/Editor all in one package. I could type in Latin, and insert any of those unusual characters by clicking a button on my Favourites toolbar, with its symbol on the button. Having now checked out your BabelPad, my previous comment for a Favourites toolbar would be better directed to BabelPad than BabelMap. Your Manchu and Tibetan buttons are just what I had in mind for my most frequently used Latin characters/marks. BabelMap has a "Bookmark" feature which allows you to bookmark up to 32 characters (highlight the required character and press the Insert key), which is not quite what you want, but does allow you to quickly enter a favourite character -- select the required character from the Bookmark menu and then simply hit the Return key to enter it into the edit buffer. For BabelPad, the Insert menu does already list quite a few frequently used format and punctuation characters, but I agree that a user-definable list of favourite characters would be a very useful feature for BabelPad, and I will add it in the next version (later this year, probably October). I download a TrueType font, Andron Scriptor Web, which has the Latin Extended-D character set, as defined in the latest Unicode v. 6.0 spec, with the Latin symbols I am interested in starting at U+A750. When I load this font into BabelMap and scroll down to A750 all the characters are there. However, when I open the Windows XP Character Map, and load the same font, and select Unicode for the character set, I find that Character Map shows characters up to U+2767, then it jumps to U+E004, thus jumping right over the Latin Extended-D characters. Do you have any thoughts on why this might be happening? The simple answer is that character map is (to put it politely) not very good, and has not been updated to reflect new versions of Unicode since it was created. The version that ships with XP is stuck in the world of Unicode 3.0 from 1999, and will only display characters that were defined in Unicode 3.0 (i.e. only 49,259 out of the current total of 109,449 characters). The versions of character map that ship with Vista and 7 are not much better. I got into investigating the MS Character Map as I was putting together a Visual Basic 2005 app for a simple Latin Text Editor, and I wanted buttons across the top to provide quick access to the special Latin symbols, but they just would not display (with the Andron font selected, and a code such as U+A702. With help from the VB forum I discovered that if Character Map could not see a character, then neither could the RichTextBox control on my form. All characters that Character Map could see could all be displayed no problem. So I am struggling to see the connection between the MS Character Map and the Unicode version it uses, and why a RichTextBox control behaves in the same way. Update. I have now discovered that if I use a TextBox or a Label, rather than a RichTextBox, then all unicode characters are displayed, regardless of whether Character Map sees them or not. WordPad uses a RichTextBox, and Notepad uses a TextBox. This explains why copied characters from BabelMap pastes fine in NotePad, and can produce unexpected results when pasting in Wordpad. Hope this helps someone. Most Honourable and Noble, Mister West, please note my enduring affinity for your unparalleled work; diligence in propagation, and perfection of the thing called "Unicode", and your exemplary benevolence in continued development of priceless, powerful, and rather prerequisite software (yes, i was going for alliteration... doh!) in BabelStone software. I thought of a recommendation. Typically, as a User, I must-have BabelMap in my "QuickLaunch" items. It occurred to me, momentarily, how convenient to launch BabelPad from a [user conf'd] button, on/off displayed maybe, toobar-wise, in BabelMap. Yes, I realize BabelPad has something of a babelMap, built-in (in fact, my original, only knowledge of such a map, was of BabelPad's). Rather than I ramble so much, more, I conclude: you dig? Rock on! hugs n hugs. n air-kisses, one-cheek, two-cheek (all fancy-like, you know). Thank you for BabelMap - a great utility. One problem - UCN outputs the code point in hex but it should be decimal. E.g. U+2070 SUPERSCRIPT ZERO in UCN should be \u8304, not \u2070. Please ignore my previous post. BabalMap's UCN is the C/C++ UCN, which takes 4 hex digits. I was trying to use it for RTF \u codes, which look the same but take a decimal sequence. NCR decimal is close enough for RTF \u codes. BabelMap is absolutely indispensable for anyone who is not satisfied to stay within the narrow confines of ASCII/ANSI. But now I have a problem. In the past I have always been able to put any glyph from any Unicode font installed on my computer into the Edit Buffer, copy it, and paste in into a Word doc. This morning, however, when I paste I get only a box or whatever empty symbol goes with the font in question. What am I doing wrong? I'm sorry, I have no idea what has caused this problem. Perhaps Word has been updated, and now behaves differently. Thanks for BabelMap and BabelPad. I find a little glitch about ⁒ (U+2052 COMMERCIAL MINUS SIGN) in BabelMap with "Character Name Display and Search" set to "Unicode Name plus Aliases". I think the word in question should be abzüglich (German) instead of abzlich (German), which the glitch is using U+E161 in, I guess, 細明體_HKSCS. Hmm, it displays OK on my system, so BabelMap is not setting the wrong text. It appears your system is reinterpreting the code page and reading it as if it were Chinese. What Operating System are you using, and what are your locale settings? I find that if I set the Formats to English (United States) or some other locales, the problem is gone. Thanks for the additional information. I have been able to reproduce the problem by setting the format to Chinese (Simplified, P.R.C). I will investigate, but as I am busy on other projets at present I will not be able to do so for a few weeks. No, I'm afraid that PDF export functionality is not something that I intend to add to BabelPad. There are plenty of "Print to PDF" tools available that you can already use with BabelPad (e.g. CutePDF). When I use the Windows (7 64-bit) utility Character Map, copying and pasting characters into a Windows document brings along the font info for each character. BabelMap doesn't appear to provide any font info at all; even the Edit Buffer doesn't seem to know what font is associated with each character. Am I doing something wrong? If not, what use is the Composite Font feature? It only displays in the last selected Single Font. That is correct; when you copy from BabelMap it only does a plain text copy. I will investigate the possibility of implementing a rich text copy like Character Map. the Edit Buffer doesn't seem to know what font is associated with each character. That is correct. The edit buffer is an ordinary Windows edit control, which only allows for a single font. I hope to implement a rich edit control which will use multiple fonts in a future version of BabelMap. If not, what use is the Composite Font feature? 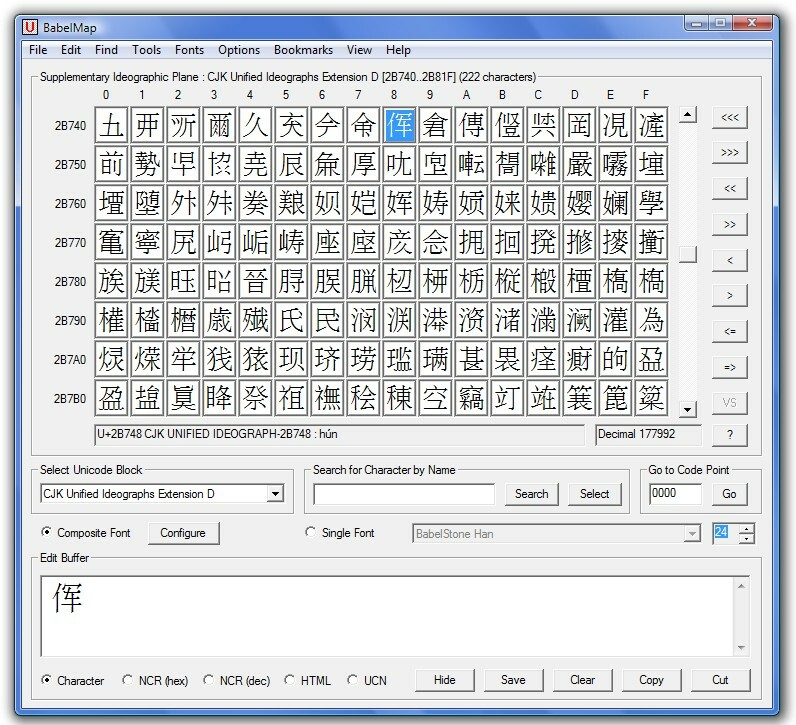 It allows the character grid to to display different Unicode blocks using different fonts. I suspect that this may be related to the problem "izhnannyk" saw back in September. No, that cannot be the case, as BabelMap has always had this behaviour, and izhnannyk was reporting a change in behaviour. The latest version of BabelMap now supports rendering of multi-script text in the edit buffer using the user-defined composite font, as well as RTF copy.